Join the Midwest’s fastest growing car community and prime owner-to-owner buying and selling network! Cruz puts you in control of vehicle ownership. Buy and sell your way when you choose to list your car for sale, not for sale, or open to offers. With Cruz, you’re in control. Looking to buy? Cruz is the place to snag a great deal from other awesome owners! 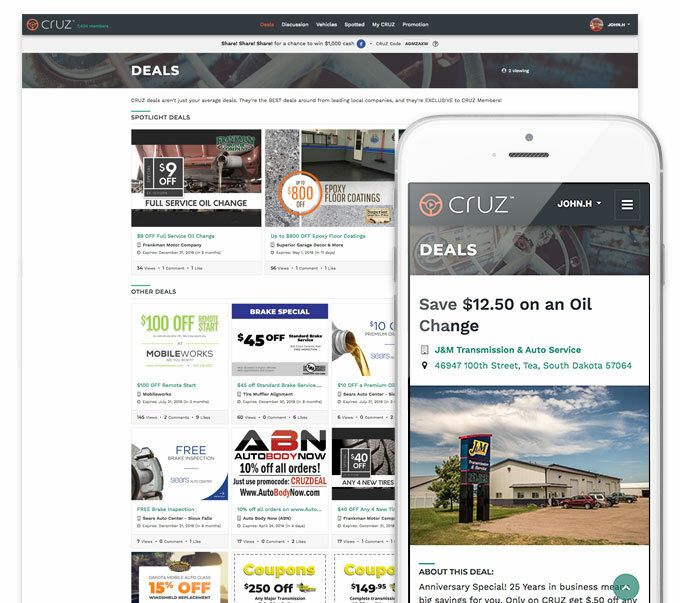 Cruz is a buyer-to-buyer network, so there’s no dealer markup, letting you save big on your next family car, utility vehicle, dream car or restoration project. Have you considered selling but aren’t fully committed? No problem! List your car and see what happens! For the right price, you might be ready to let it go! Aren’t selling right now? When you’re ready, simply update your status and your vehicle is on the market! 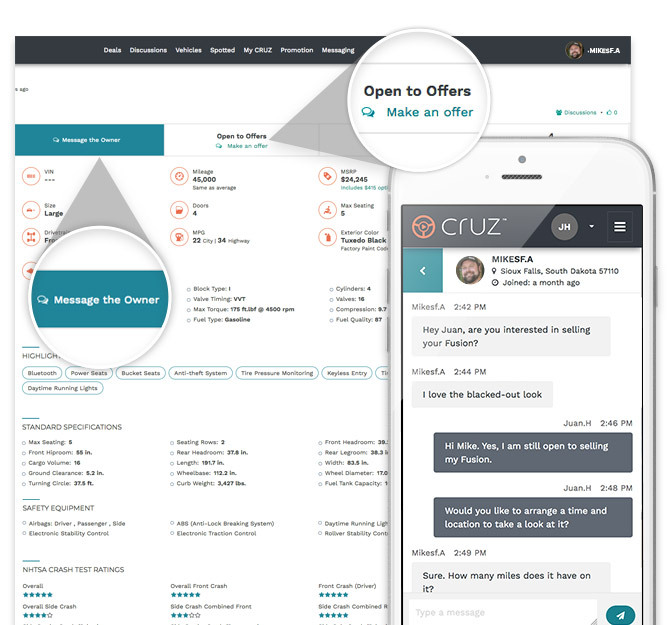 Community Search over 11,000 vehicles to see what other Cruz members are driving, showing, and restoring! Filter by make and model, year, and even sale status. Connect with other car enthusiasts and ask for tips or share advice of your own! Manage your cars, your way, in your personal vehicle portal. Not only can you see tons of manufacturer details and specs on your cars, you also get free vehicle history reports! Add photos, notes, and more. Spot it. Post it. Love it. Get ready, you’re about to experience your new favorite car community! Crazy and fun cars are spotted and posted daily – from beaters to muscle cars and beyond – snap a picture and post it! 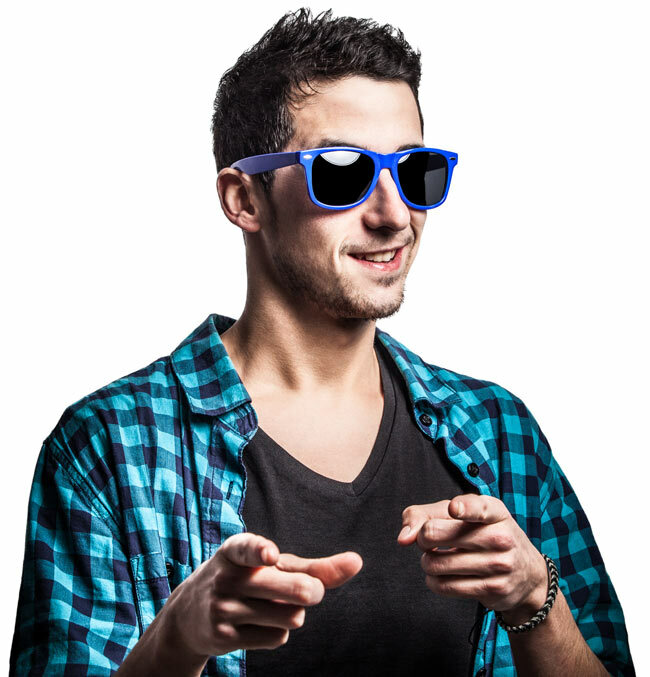 Like photos and leave comments on others to get in on the fun! Take advantage of specials and discounts you won’t get anywhere else from local auto businesses! From car washes, to remote start discounts, and even rock chip repair, Cruz deals has you covered. Get in on the most popular deals among Cruz members before they’re gone. Tons of awesome deals are waiting to be redeemed – scroll, click, and save away.